Hearings for 75 people whose votes are being challenged will be scheduled, as opponents of the plastic bag ban referendum result have filed a letter stating a more specific basis to throw out ballots. WATERVILLE — Opponents of a plastic bag ban have fulfilled a request by the city to submit more specific information about why they are challenging 75 voters who cast ballots for the ban in the November election, a move that enables a city board to consider their appeal. The City Council on Tuesday voted to certify results of the Nov. 6, 2018, election, which show voters approved the bag ban, 3,046-2,927. The ban prohibits stores of 10,000 square feet or larger from dispensing single-use plastic bags. 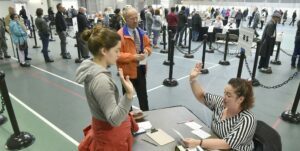 Cathy Weeks, Jonathan Weeks and Shaun Caron, of Waterville, and Mark Andre, of Oakland, filed an appeal March 14 with the Waterville Voter Registration Appeals Board, asking that it look at 75 voters, most of whom are Colby College students and professors. Their appeal letter, consisting of two paragraphs, did not adequately specify the basis for their appeal, according to City Solicitor William A. Lee III. He said that, in order to start scheduling hearings for the board and the 75 voters, the opponents must resubmit a request for appeal, and that Andre, of Oakland, may not appeal because he has no legal standing in Waterville as an Oakland resident. The Weekses and Caron submitted a letter, dated March 18, to Roland Hallee, chairman of the Voter Registration Appeals Board, with more specific information about why they are appealing. Lee confirmed Thursday that the letter contains adequate information. “The letter is legally sufficient, so the board and the voter are apprised of what the issue is,” Lee said. The challengers’ initial request said only that the basis for the appeal was that they were unable to determine from evidence provided by the voters and registrar in hearings in the period from Nov. 12 to Dec. 14 last year that the voters met the standard for provision of proof of qualifications to vote in Waterville as specified in election laws. Their March 18 request presents a more lengthy explanation for why they are appealing. It says they suspect the challenged voters swore an oath of residency and submitted no other proof of residency to confirm the validity of their oath. That oath, according to the opponents, is a statement of intention that by its definition does not meet the standard of proof required by law and requires additional evidence that the voters established Waterville residency. The letter goes on to say that while Andre is not one of the challengers, he will assist them in presenting their case and will be a witness at the hearings. Beside his name at the end of the letter is a request that any information provided to challengers also be provided to him. Andre can not legally be a challenger, according to Lee. “To be able to challenge somebody’s ability to vote in the municipality, you must be a resident of that municipality,” he said. Whether Andre, who is not a licensed attorney, will be able to assist or represent the challengers at the hearings has not yet been established. The question becomes, in what instance may a non-attorney essentially act as an attorney, according to Lee. In some administrative matters, a person can have a lay person act as an advisor, he said. The hearings will be open to the public and subject to freedom of access laws, and the public must be given notice that they will be held, according to Lee. He said the appeals board at times could go into executive session. He said the voters whose ballots are being challenged must have a 20-day notice of the hearings, and they have not yet been notified. Hearings could start as early as late April, he said. He said he must work with Hallee to see if there are common issues among voters so a number of hearings can be consolidated instead of having to hold 75 separate hearings, which could take an extensive period of time. Some of the voters probably will bring their own attorneys to the hearings, at which Lee expects he will represent the appeals board, though he plans to discuss the matter further with Hallee, he said. The challengers initially took the voter issue to that court, which dismissed the case and determined the ballots are no longer challenged because opponents failed to file paperwork requested by the court. Asked what he expected will occur at the city appeals hearings, Lee said that, for starters, the city registrar’s information about the voters would be introduced. Patti Dubois is the city’s registrar, in addition to serving as city clerk. Registrar’s evidence could include photo IDs, the last four digits of a voter’s Social Security number, a prior oath of residency taken and the most recent oath of residency, including physical address, he said. “Whether the voter would bring in other evidence, it’s too early to say,” he said. As registrar, Dubois has the final say on validity of voter registrations. Asked about criteria a registrar may use to determine residency, Lee said there are many criteria. One does not have to present a driver’s license, as some people do not drive, he said. Andre attended Tuesday’s council meeting, where he told councilors and city officials that he has a residence at 229 County Road in Waterville, but his mailing address is in Oakland. On the March 18 appeal letter to the Voter Registration Board, Andre’s address is listed at the bottom as 33 Holmes Farm Road, Oakland. A check of Waterville’s assessor database does not list Andre as the owner of 229 County Road. Contacted Thursday, Andre said he has a “lease agreement” for 229 County Road, and he does not own that property. At the council meeting, Councilor Winifred Tate, D-Ward 6, had asked Andre if he was a resident of Waterville, to which he asked her if she had reason to believe he was not a resident. Tate said she had been told by the city attorney that Andre doesn’t have legal standing to comment on the voter issue, at which point Mayor Nick Isgro asked Andre to cite the address of his Waterville residence. It was then that Andre cited 229 County Road.